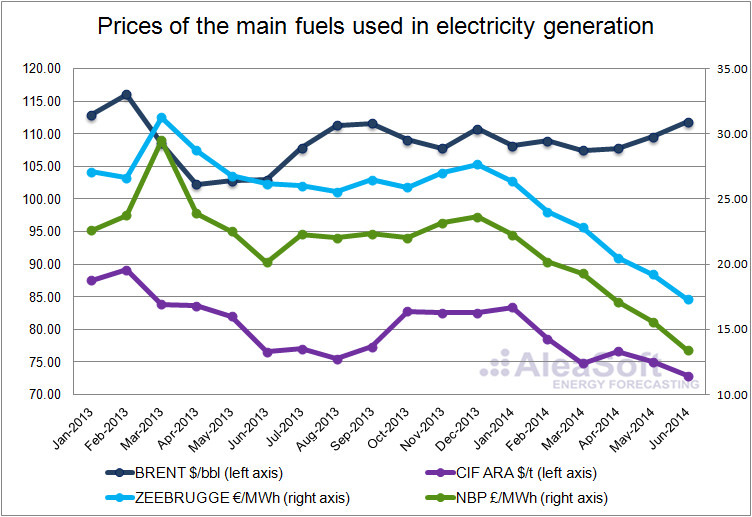 July 9th, 2014 – In the first half of 2014, the prices in the main European wholesale electricity markets have been lower than in the first half of the previous year. 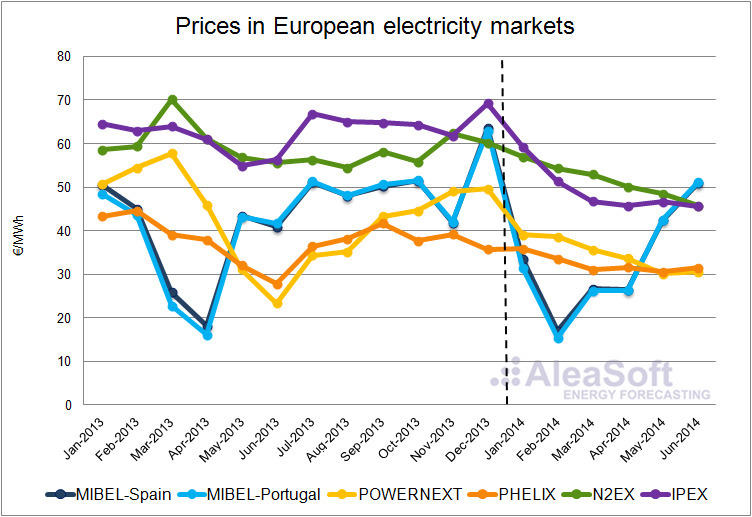 The high prices around March 2013 in POWERNEXT and N2EX markets, and to a lesser extent, in the IPEX market, contrast with the constant descent of prices in the first months of 2014. The seasonality of the hydroelectric and wind power production has kept determining the MIBEL market behaviour. The price in the PHELIX market has been more stable than in the same period of the previous year. The prices of the N2EX are expressed in €/MWh, they have been obtained from original values in £/MWh. Data sources: POWERNEXT – EPEX SPOT, PHELIX – EPEX SPOT, N2EX – NORD POOL SPOT, IPEX – GME, MIBEL – OMIE. The prices in the MIBEL market in Spain and Portugal were lowering at the beginning of the year 2014, after the high values registered in December 2013. They recorded in January a monthly average price of 33.62 €/MWh in Spain and 31.47 €/MWh in Portugal. This means 16.89 €/MWh and 17.06 €/MWh less than in January 2013 for Spain and Portugal respectively. After that, the price has shown the usual seasonal behaviour. The lowest monthly average price was in February in both Spain and Portugal with 17.12 €/MWh and 15.39 €/MWh respectively. At the same time, the maximum value of hydroelectric production was reached together with a high wind power production. The average price in the market during the first six months of 2014 has been 33.07 €/MWh in Spain, 4.22 €/MWh below the average price of the first six months of 2013, and 32.39 €/MWh in Portugal, 3.59 €/MWh less than in the first half of 2013. At the hour 20 of March 27th the maximum price was achieved in Spain, 133.92 €/MWh, while in Portugal it took place in the hour 22 of February 17th with 110.00 €/MWh. The minimum price was 0 €/MWh and occurred during 177 hours in Spain and during 195 hours in Portugal between January and March. In 2014, the price in the POWERNEXT market in France have been lowering until a stabilization in May and June (30.11 €/MWh and 30.65 €/MWh respectively). The average price in the first half of 2014 was 34.61 €/MWh, which means 9.21 €/MWh less than the first half of the previous year. Between March and June, the monthly average price in the PHELIX market has been stable between 30.63€/MWh and 31.58€/MWh. The average price in the first half of 2014 was 32.36 €/MWh (5.04 €/MWh less than the same half of the previous year). In February occurred the largest descent on a year-on-year basis (11.03 €/MWh) due to the high prices in February 2013. The British market N2EX registered a price fall of 8.90 €/MWh in the first half of 2014 compared to the same period in 2013. The main reason was the high average prices in the wholesale electricity market in winter 2013, caused by the low temperatures occurred then. In March the largest variation on a year-on-year basis was registered (-17.16 €/MWh). In the IPEX market in Italy, the average price in the first six months of 2014 was 49.24 €/MWh, 11.34 €/MWh less than in the same months of the previous year. The most important price fall (17.24 €/MWh) on a year-on-year basis occurred in March. AleaSoft’s price forecasts for the electricity markets in the second half of 2014. 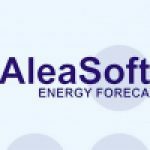 Aleasoft’s forecasts for the second half of 2014 indicate a slight descent of the average price in the MIBEL market is Spain and Portugal compared with the second half of 2013. Lower prices on a year-on-year basis are also expected in the POWERNEXT market in France and in the PHELIX market in Germany and Austria. However, the most important price descents in this second half of the year compared to the same period of the previous year are expected in the British market (N2EX) and the Italian market (IPEX). The price of the Brent oil barrel has remained very constant and stable around the average value of $108.93 during the first half of 2014. The difference with the average price in the last half of 2013 has also changed very little, -0.79 $/barrel. The gas price, both the Zeebrugge and the NBP gas, has been diminishing continuously during the first six months of 2014. The Zeebrugge gas has fallen from an average price of 26.35 €/MWh in January, to 17.61 €/MWh in June. On the other side, the NBP gas price has lowered from a monthly average of 22.23 £/MWh in January, to 13.40 £/MWh in June. Comparing these prices to the ones occurred in the first half of 2013, the fall is even more important, mainly due to the high prices registered during the low temperatures occurred in Europe in March 2013. The descending trend of the CIF ARA European coal price registered during most part of 2013 has remained during the first half of 2014. The average price in January was 83.38 $/t and the month with the lowest average price, 72.85 $/t, was June. Data sources: BRENT – EIA, CIF ARA – EEX, ZEEBRUGGE- NetConnect Germany, NBP – ICE ENDEX. AleaSoft’s forecasts for the second half of 2014 point to small variations in the fuels price. A slight increase is expected for the price of the Brent barrel. For the rest of the fuels, Zeebrugge and NBP gas and CIF ARA coal, slight descents are expected. 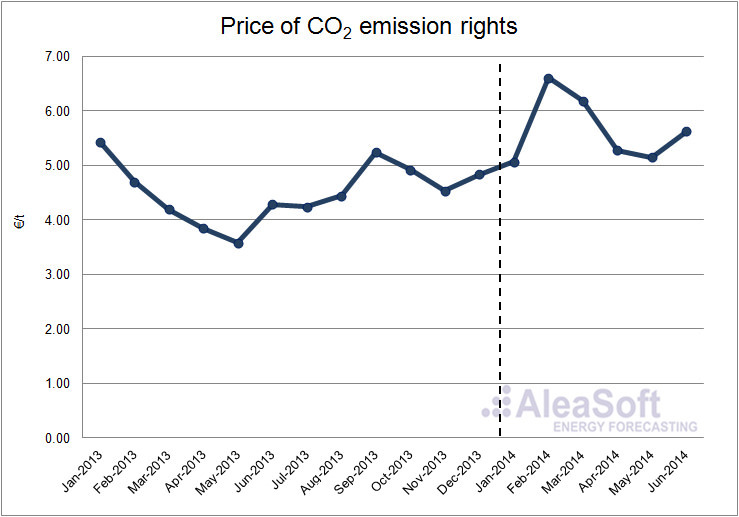 The average price of the CO2 emission rights during the first half of 2014 has been 5.64 €/t, 0.95 €/t higher than the average of the second half of 2013. The highest monthly average price occurred in February with 6.61 €/t. The price in the second half of 2014 is expected to be slightly lower than the first half.